Yellowstone National Park is not short on adventures and sites to be seen. When planning a trip to Yellowstone with kids it can be a bit overwhelming. There is so much to take in and see that you may feel like you need several weeks to enjoy the park. While you could definitely spend a week or more exploring there, you can do a lot in Yellowstone in two days. My family loves to get out and go hiking and exploring nature together. Normally, with two-year-old twins we choose to stick with day trips close to home. Recently, I felt rather brave. We decided to head to Yellowstone National Park for a weekend with our kids. It was kind of last minute, and I was worried about how it would go as it was also the twins first time camping. Even with all of my fears it went really well. We had so much fun that we are planning to go back just a few months after our last visit. I worried how much we could get done on our short visit to Yellowstone with kids. We actually fit a lot in. In fact, I am convinced that you can get a pretty good visit in with just two days in Yellowstone. It takes a little planning, but it can be done. There is no shortage of lodging options in the Yellowstone area. 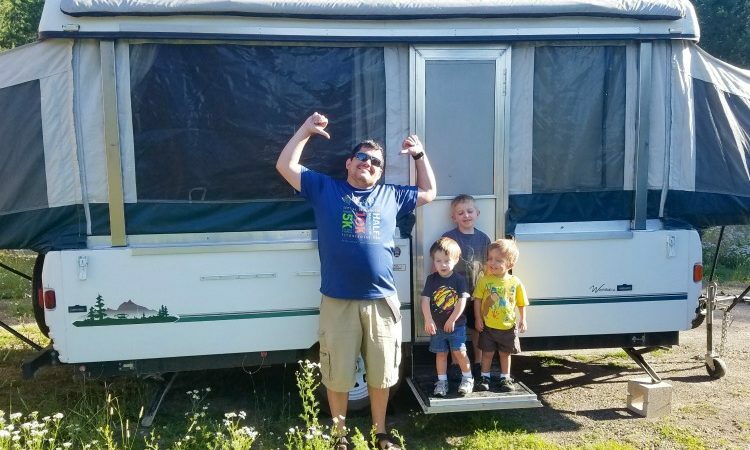 Where you stay will depend on where you are coming from, your preferred lodging option (tent, camper, or hotel), and your budget. Yellowstone has five entrances. Coming from Idaho, we enter through West Yellowstone, Montana or “The West Entrance” of the park. This area has several lodging options in or around West Yellowstone. From camping at campsites, to vacation rentals, KOAs and hotels, the options are numerous. We stayed about 30 minutes away in Island Park, Idaho because my sister lives there. Yep, we went the staying with relatives route. However, she did not have room for our family in her house, so we took a tent trailer and stayed on her property. This worked out great for us as we did not have to pay extra fees for lodging. There are also lodging options inside of the parks, and near all of the park entrances. My family has also stayed in Cody, Wyoming in the past and loved that area. Inside the parks, lodging options include several campgrounds and a few resort or hotel options as well. If you want to stay in the park you will need to make your reservation well in advance as spaces fill up early. I feel like Yellowstone is perfectly laid out for a two day visit. The major roads in Yellowstone make a figure eight. One that looks like it was drawn by a preschooler, but you get the idea. When going for two days, it is easy to do one loop each day. Perfect, right? The more northern sections of the top loop may not be open until mid-late May due to snow, so be sure to check on the road conditions before your visit. The most popular stops tend to be along the lower loop, so this loop is best when spending a full day in the park. This loop includes Old Faithful, The Grand Canyon of Yellowstone with the upper and lower falls, the most popular geyser pools, Yellowstone Lake, and more. The upper loop includes Mammoth Hot Springs, Tower Fall, and the Petrified Tree. Both loops will include plenty of wildlife during cooler months. Going in the spring lets you spot several young with the wildlife. My family has seen Bald Eagles, bears, bison, elk, coyote, and more. Viewing wildlife is one of our favorite reasons to visit the park. I was a bit worried heading into Yellowstone with kids that they would just think it was a long day of driving. While we did a lot of driving, we made plenty of memories that they will remember for years to come. I asked my oldest son, The Goof, age seven, before we went what he remembered from his last trip three years earlier. I really thought he would say nothing, but to my surprise he remembered a few things. 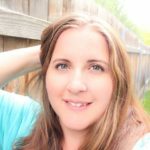 So here are some of the things he remembered, plus some of our favorite things we did this time, and you will definitely want to do during your two days in Yellowstone. This is the number one thing that my son remembers and I am not surprised. 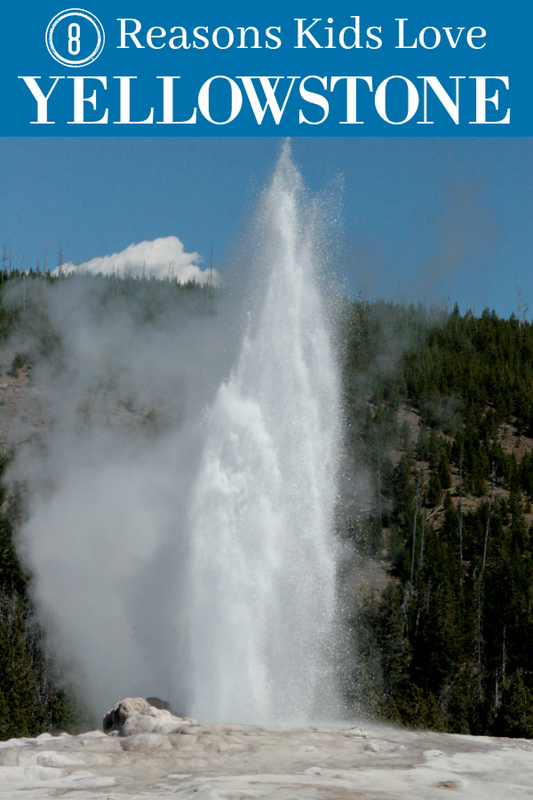 There is something pretty awesome about watching Old Faithful Geyser erupt. Old Faithful Geyser erupts approximately every ninety minutes, plus or minus ten minutes. Traveling Mom Tip: Check the eruption times for Old Faithful at the park entrances and at the Old Faithful Gift Shops. My personal favorite thing to do is to watch one eruption, go explore the gift shop, and then go take a picture with the sign during the next eruption so you can see Old Faithful erupting in the background of your picture. Like many national parks, Yellowstone has a junior ranger program for children. Kids go to the ranger stations where they get their passports. Then they take the passports to all of the visitor centers and get them stamped while learning about Yellowstone. At the end, your children receive a patch or badge making them a Junior Park Ranger. Yellowstone with kids involves a lot of driving, but looking for all the different wildlife while driving helps keep kids entertained. My son even bought binoculars to help spot wildlife in the distance. We almost always see bison and elk, but we often spot other wildlife as well. Remember to teach your kids not to approach wildlife and to respect their home. It is easy to forget that Yellowstone Lake is just that, a lake. It is so vast and at times the land on the other side is not visible, making you feel like you are looking at the ocean. 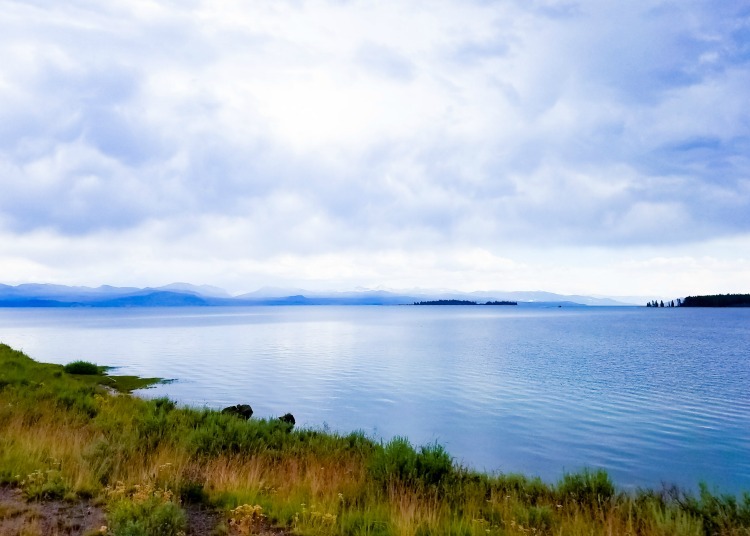 There are many great places to stop along Yellowstone Lake to take in the view. Our personal favorites are Bridge Bay for a nice picnic area and campground. My kids love going to the nearby marina and watching the boats coming and going to the lake. Grant Village is a visitor center with a water front view and delicious ice cream (see number 8). When we stopped here, my son asked if we were at the ocean because you really could not see the land on the other side. Yellowstone is home to several geyser basins My kids love seeing how pretty the water in the geyser pools look. They are so blue. Most of the trails with the geyser pools have a board walk. We loved strolling the boardwalk and looking at the pools of water. TravelingMom Tip: Hold on to your little ones, wear them in a carrier or push them in a stroller. The geyser pools are extremely hot, so you want to make sure little ones do not get too close to the edge of the board walk. Kids love that you can stand right at the brink of the upper falls where it goes over the edge. When we went this time, we got to the brink, and it immediately started raining. We snapped a quick picture and got out of there, but my son still talks about how cool it was. This trail has several stairs to get down to the falls, climbing back up after, and there are no hand rails on both sides, so you can get a workout in while enjoying the view. Probably one of the most iconic locations in the park, Artist Point gives amazing views of the lower falls and the Grand Canyon of Yellowstone. My kids loved the look out points and that this area let them burn energy off with some room to run. Yellowstone has some seriously yummy ice cream. My family always make a point to stop at one of the many visitor centers and get some ice cream. It is a delicious treat and has become a tradition for us. We normally get ice cream at either the Canyon Village Visitor Center or at Old Faithful. In fact, it is the perfect way to pass time while waiting for Old Faithful to erupt. Whether you are just passing through the Yellowstone area or making it your destination for your family vacation, if you have two days in Yellowstone, it is definitely worth the stop. Even better, Yellowstone, like other National Parks has many free admission days through out the year. That’s perfect for those on a budget but still wanting to enjoy the United State’s First National Park. Great insights and wonderful pictures!